This view shows the situation of Tinkers Lakeside Lodge on a 1 hectare stand. A paved circular driveway makes for easy access. The garden is well treed with extensive lush grassy areas. 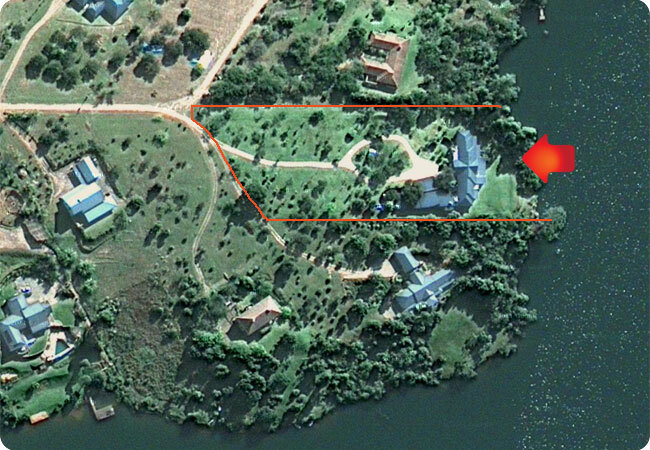 Dagama Lake Estate lies on the shores of the Dagama Dam in southern Mpumalanga and is surrounded by panoramic hills covered with forests and sub tropical fruit farms. The estate is inhabited by many species of small animals including duiker, mongoose, jackals, civets and genets and the bird-life is phenomenal. Fish eagles, kingfishers, bee eaters and numerous other species are spot­­ted daily. Not only is Dagama Dam a bass fishermans paradise, but offers everyone who loves to be outdoors in nature a memorable experience. The dam has not been commercialized. Every 2nd Sunday however, a cluster of colourful yachts drift past the lodge. Motorised boats are not allowed in the water (Silent electric motors are allowed to the fortunate few who have been granted access to the dam) and so the tranquility and bird song prevails. The yacht club is strict and memberships are required for boats to be launched. Most days, the dam is left untouched except by the geese and other birds. The boats at the estate are allowed to be moored at the owners property – most others need to be docked at the Forest Sailing Club. The surrounding forests offer endless cycling or biking routes. In fact one of the most popular triathlons in the Lowveld is held annually at the yacht club.